Countdown to ‘The Voice’ Season 3: What Should You Watch For? It’s the day we’ve all been waiting for (since May, anyway): the premiere of Season 3 of The Voice. There’s a lot to talk about this time around, as we’re still catching our breath from the end of Season 2. This is the season that could either be an incredible boost to NBC, or we could be talking about it as the season that didn’t quite work. There’s only one way to find out, and that’s by tuning in and seeing what happens. 1. The ratings. How will The Voice perform in the fall? Not only is it going head-to-head with FOX’s revamped The X Factor, but the fall is the start of the new TV season, and that means more shows that viewers will have to choose from. Will NBC’s hopes that the show will carry them year-round come true, or will viewers turn back to their favorite scripted series? And what kind of numbers will the show have to deliver to keep the network (and the media) happy? Is it just beating its competition, or does the show need to be a smash hit yet again? 2. Viewer fatigue. Related to #1, The Voice is now running for two cycles a year, and at least twice a week. We’ve come a long way from the once-a-week schedule that we started with. This week’s premiere stretches across Monday, Tuesday and Wednesday nights. That’s a lot of show for the audience to keep up with, and it doesn’t stop there. With Season 3 on track to end in December and Season 4 possibly starting in February 2013 (if it keeps in line with Season 2, which started February 5), that’s a mere two months between installments. Will even the most die-hard fans find it to be too much of a good thing? Even if the viewers tune in, the show still has to keep them coming back. 3. The coaches. While nothing has been decided yet, the general consensus is that it will be very difficult for The Voice‘s superstar coaching panel to continue their own careers and stay in their chairs for two seasons a year. We’ve already seen Maroon 5 have to reschedule their North American tour and Cee Lo Green delay his Las Vegas residency in order to accomodate the show’s shooting schedule. 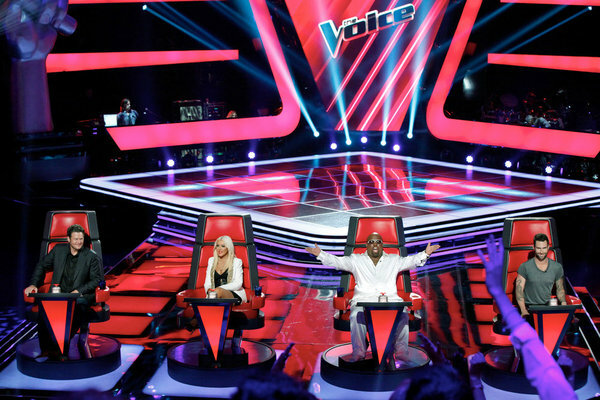 This may be the last time we see the original lineup of Adam, Blake, Cee Lo and Christina in those big red chairs, and so we should appreciate them now more than ever. No matter what team you’re on, we all know that the show wouldn’t be the same without all of them. 4. Their conflict. There were murmurs last year that the bickering between Christina and Adam had a negative impact on the hopes of their finalists to win the competition. Team Cee Lo’s Tony Vincent told me that he was “shocked” that Team Adam’s Tony Lucca didn’t win Season 2, and he was just one of a few people who thought fans may have been turned off by the Adam-Christina arguing when it came time for the final vote, which saw Tony Lucca and Team Christina’s Chris Mann finish third and fourth, respectively. We’ll never know whether or not that’s the case, but artists and fans alike commented on the conflict. Did the coaches notice and will they play nicer in Season 3? 6. The effect it will have on Season 2. There’s no doubt that this season was rushed into production. There was a grand total of one week between the Season 2 finale airing and Season 3 being formally announced in New York. We don’t yet know if or how that will effect the show itself, but it certainly didn’t help the artists of Season 2. After Season 1, the singers had the better part of a year to take advantage of post-show press and put out new music; they even got their own mini-concert tour. Season 2’s artists not only didn’t tour, but they’ve had just barely four months to make their next moves. Obviously, talking about Season 3 is going to take some attention away from the Season 2 folks, but hopefully not so much that we forget about them. Having spoken to a few of them recently, they have some great music ahead of them! We’ll have to see how all of these things unfold over the course of Season 3, and you don’t want to miss a moment of it. The Voice begins its three-night premiere tonight at 8 PM ET/PT on NBC. For the latest news and updates all season long, follow me on Twitter at @bigredchairs. I’m really afraid that this will be too much of a good thing, though, so I’m watching Season 3 with a careful eye.